manager, Sister Sledge was born. academic studies, each of them earning a Temple University college degree. Best Produced CD, and remains one of their finest artistic achievements. Glastonbury Music Festival in the UK. Scottish electronic producer The Revenge, on the track Stay A While, in London. 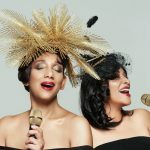 studio working on new material including a single set for release in Spring 2016.
group, Sister Sledge has earned over 100 awards and commendations.